I had the opportunity to interview him on his journey to the AFL, his career, and how his life has been since. Lachlan Shaw: Thank you for joining me Jason, it has been muchly appreciated. Jason Heatley: Not a problem. Shaw: You explained to me earlier in the week that you are in the middle of an annual leave break, have you enjoyed your short holiday? Heatley: Yeah it was really good mate. We took the family down to Blairgowrie and just had a bit of ‘R&R’. The kids had a good time and it was a nice break before they go back to school for term four. Shaw: Did you watch this year’s AFL Grand Final? Heatley: Yeah, I certainly did. It was a great game to watch, the pressure was immense. There was disappointment for Collingwood but for the Eagles to fight back from five goals down, they were much deserved winners of the flag this year. Shaw: Do you still watch much footy these days? Heatley: I do, I try to watch it as much as I possibly can. I probably get a little bit frustrated like a lot of people do with how the game is played at different times. But when you get to the finals type of environment I think everything gets thrown out of the window and we get back to that man on man action that we saw throughout this year’s finals series. Shaw: Do you follow any other sports? Heatley: I’m a boy’s boy. I like cricket and basketball. I enjoy watching the NBA and American gridiron. If there is sport on TV, much to the disappointment of my beautiful partner I will watch it. Heatley: I grew up in the Preston/Reservoir area of Melbourne, I have one brother and he is 10 years younger than me. There is a bit of an age gap between us, but we were the really sporty type of kids. I went to school in Preston at the Sacred Heart Primary School and then went to Reddan College which now known as Parade College. As far as sport goes, I just mainly played cricket and footy. I was really lucky that I had a good upbringing with Mum and Dad. Shaw: From an early age, what was it that fuelled a desire for you to play football at the highest level? Heatley: To be honest, the higher-level stuff didn’t really eventuate for me until I hit the age of 20. As much as I loved playing junior footy all the way through I was never really talented enough to get into any of the talent squads or pathways as such. My journey to the AFL was a little bit longer than normal but I suppose that also helped me to get to where I wanted because when I went across to Perth and played for Subiaco, I always had a bit of a dream over there and I was lucky to get recruited into the AFL. Shaw: Who did you play for in the juniors leading up to your AFL career? Heatley: I was a Reservoir Colts junior and then I went across to North Heidelberg in what was the old Diamond Valley Football League. Shaw: Did you enjoy your time in juniors? Heatley: Absolutely I loved it, who doesn’t? Running around, chasing the footy and playing with your mates is what it’s all about. Shaw: How did you feel when you got drafted into the AFL system? Heatley: I was obviously delighted, it was something that I didn’t expect to happen. I was first drafted by the West Coast Eagles in November 1993 and it was an exciting time of my life. However, I also knew that by walking into a footy program of the Eagles calibre that I had a lot of work to do before I was ready to play senior footy. Shaw: What were your feelings towards relocating to Perth at a young age to pursue your football dream? Heatley: That was just a life decision for me. I went across there to play for Subiaco initially and I got myself a good job, so I settled in nicely. What happened after that was probably a little bit unexpected for me (moving back to Melbourne) but it just navigated the next seven or eight years of what I was doing so that wasn’t an issue. Shaw: Do you have any advice for AFL players who are experiencing difficulties with homesickness? Heatley: I think that with the younger guys coming in through in the elite programs, with the nature of the competition and the way it is, they could end up anywhere. That’s the brutal reality. I also think that the AFL needs to look at making sure the clubs are protected when they draft someone because it’s a pretty big investment. Let’s use Tim Kelly from Geelong as an example, he’s a first-year player for them at the moment and a middle age recruit. After one season he wants to go home to Perth. I do understand it in some cases, he’s got three kids so fair enough but for the younger guys in the system I think they should be obliged to stay at the club that drafts them for two to three years as a bare minimum. Shaw: While playing for Subiaco in the WAFL you twice won the Bernie Naylor Medal for most goals kicked in a season, also kicking over 100 goals in both of those years. 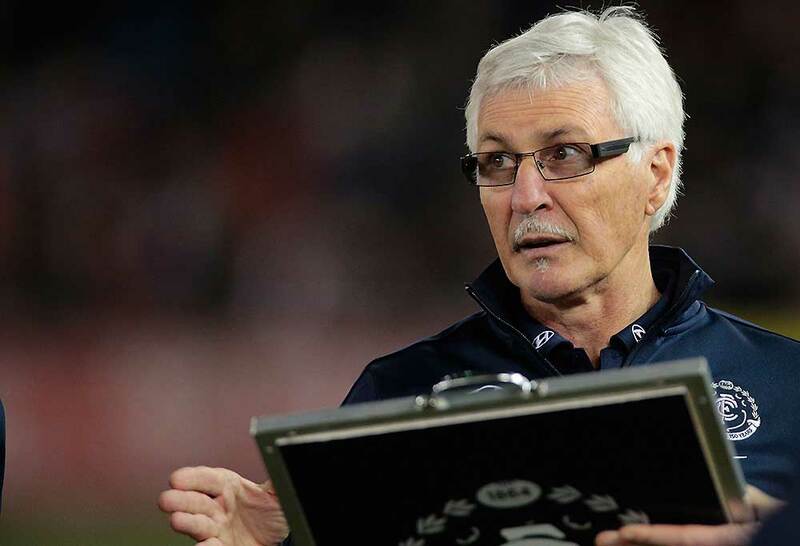 Naylor was recently inducted into the AFL Hall of Fame. Looking back now, what does it mean for you to have twice won a medal that carries the name of such a significant footballer in Western Australia’s history? Heatley: It’s a great honour, there’s no doubt about it. The WAFL was a really good competition back in those days so I was lucky enough to kick quite a large number of goals and to come away with a couple of awards like that is something that I will always cherish. Shaw: Why did things not work out for you over in the West? Heatley: It’s not that it didn’t work out, I suppose that’s where I got my real grounding to understand what you needed to do to become an AFL player. The first year I was there was 1994. The Eagles obviously won the premiership that year, so they were an awesome outfit with a lot of seasoned players. In 1995 and 1996 I was sort of physically becoming ready to play but they had Peter Sumich in the side and I was just a stand-alone full forward so unfortunately that’s just the way it was. My decision at the time was to see if I could play some consistent footy, but I will forever thank the Eagles for the opportunity that they gave me. Shaw: You were coached by Mick Malthouse at the Eagles who would go on to be one of the all-time coaching greats and then claim the record for most games coached in VFL/AFL history. What was he like in his personality and to work with? Heatley: Mick was all about developing and mentoring and he was very firm in the way he went about it. He was a wonderful mentor and was ahead of his time in terms of how he read the game. He will go down as one of the all-time greats of the AFL. Shaw: While on the West Coast list, you were able to spend a little bit of time with Ben Cousins and play a couple of games alongside him. What was he like to have as a teammate and how do you feel about him now given all that he has been through and trouble that he continues to endure with his drug-related problems? Heatley: One thing I will say about Ben is that when I first met him, he was 16 years old and he was just totally driven to be the best he can. He was a young boy in a sense, but he was ready to play AFL football the moment he got onto an AFL list. Obviously, what’s transpired in the latter part of his life is really sad and we have our fingers crossed that Ben will come through it. Shaw: Explain the sequence of events that led up to your recruitment to St Kilda. Heatley: I told the Eagles at the end of 1996 that if possible I would like to get a trade back to Melbourne. I had two clubs that were really interested which were Geelong and North Melbourne. They were haggling over draft picks before the Eagles and the respective clubs couldn’t come to an agreement on picks. I went into the draft pretty confident that I would get picked up by one of those two clubs. On the day of the draft, I was out on a golf course when my phone rang and was informed that I was going to be a St Kilda player. I was a bit surprised at the time because I had not spoken to them in the lead up, but it was something I was really pumped about. Gaining a second opportunity was all I was after and being back in Melbourne made it even better. Shaw: Your first year in 1997 at St Kilda was quite successful for you personally. You finished third in the Coleman Medal race for most goals kicked across the season. Were you surprised by how quickly success came for you at a new club? Heatley: Yeah, no doubt. We rode a tidal wave of not only emotion, but I suppose spirit aswell and the guys really bonded as a playing group under Stan [Alves]. Once we got ourselves up and running we were supremely confident in our ability and I’m just a small part of that, finishing off the work of a wonderful group of midfielders and some imposing forwards aswell. Shaw: From a statistics point of view, the best individual achievement of your AFL career is no doubt when you kicked 9 goals against North Melbourne in Round 14 that year. What are your memories of that day? Heatley: It was getting ample opportunity. It was a good game of footy, a beautiful day and North Melbourne were a cracking side. I was pretty lucky to get going early and that continued for the rest of the game. It was one of the better games that I had. But I have to thank the supply. 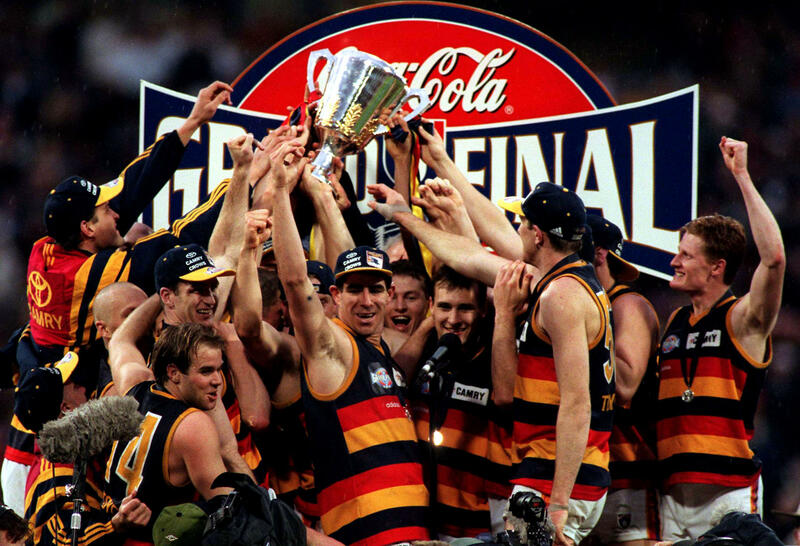 Shaw: Tell me about the 1997 Grand Final against Adelaide, how did it feel to be running out onto the MCG for such a big game? Heatley: Leading up to it, it’s a wonderful week. I suppose game day in some respects is a bit of a blur, but I will never forget running out onto the ground. You see the players doing it now whereas in recent years to be able to soak in the atmosphere is really important but then it gets down to business and playing. As much as it was a great day in my life it was probably also the most disappointing because year on year, it gets brought up and it’s one of the biggest regrets I have but what do you do? Not much. Adelaide were just too good on the day. Shaw: The Saints endured some shocking luck in the lead-up to that game with injuries to Peter Everitt, Lazar Vidovic and Joel Smith coupled with the passing of Nicky Winmar’s father the night before. Did you still think the Saints were a chance to win that game given all that had gone on? Heatley: Yeah definitely. There’s no doubt we did. We would have been a much better side if Joel, Lazar and Peter were playing. All three of those guys were first-choice players and brought surreal qualities to our side. In saying this we were confident enough, going in with the 22 selected players we had expecting to win the game. The reality was as I mentioned before was that we started really well, we were three or four goals up in the second quarter which is a big hurdle to overcome. Adelaide were able to overcome this deficit on the day, a few of their players really got going and they were too good. We saw that with the Eagles only last week. Shaw: How did you feel to be part of a side that included players such as Burke, Harvey and Loewe? Heatley: I was in awe. They are absolute professionals and it doesn’t matter what era that they would have played in, they would have been not only outstanding men and individuals but outstanding players aswell. They are champions of the St Kilda Football Club. Heatley: Stan was great. he was the one who really believed in me and gave me that extended opportunity. Stan was a hard man but a fair man in the same breath. When we were at the function that you and I attended a couple of weeks ago, I got goosebumps when I heard him talk. That’s how much of an impact he had on me. Shaw: What about with Tim Watson? Heatley: He’s a wonderful guy. I definitely got on well with him. It was a tough time for Tim to come into the club in 1999. People can have all the theories you like about coaching, but Tim gave it his all and certainly deserved to walk away with his head held high. Shaw: What are the events that lead up to your departure from the club from the Saints? Did you see this coming? What are your feelings towards this? Heatley: Everything was good, but my body was starting to slow down a little bit and the reality was that I was a full forward and a full forward only. The game was really starting to develop into a multi-purpose player type of role, so the game probably got a bit quicker for me than I probably would have liked. It would have been good to get one more year and I suppose go out on my terms, but I have no regrets and half expected that it was coming. So, I have no problem at all. Shaw: Did you ever toy with the idea of playing on at a third AFL club? Heatley: No, I didn’t. My body was done. In essence, the day I got the call to go into the club for the exit meeting was probably the reality check that I needed. Once I walked out of there, it was more relief that it was over as well in a funny sort of way. Shaw: Who do you consider to be the best player that you played with? Heatley: Robert Harvey. In saying that, there’s one other player I will throw in as well. I learnt so much from John Worsfold over in Western Australia. He showed me what footy means to him, the way he played and also the way he led as a captain. He was an amazing individual. Shaw: You made the full forward position your own throughout your career, were you ever trialed to play anywhere else on the field? Heatley: No not really because that was the role that I played before I got into the AFL for about seven or eight years. I was a specialist if you want to look at it that way. My body had developed around power, running patterns, leading angles and then finishing it off by kicking goals. I never really had the endurance tank to push too far up the ground for an extended period of time. Shaw: You were a strong full forward in an era where the game was blessed with them. You could argue that some of the spectators would rock up to games to see the likes of Tony Lockett, Jason Dunstall and Wayne Carey amongst many others kick a big bag of goals and light up the crowd with excitement. Nowadays that side of football has been phased out due to revised team structures and because of how the game has advanced over a period of time. What are your feelings towards this? Do you feel at times that the full forward position has almost become redundant in footy? Heatley: From a specialist type of role, it probably has. Will we ever see a 100 goalkicker in one season again? I hope so. The way the game is played now is probably making it a little more difficult. 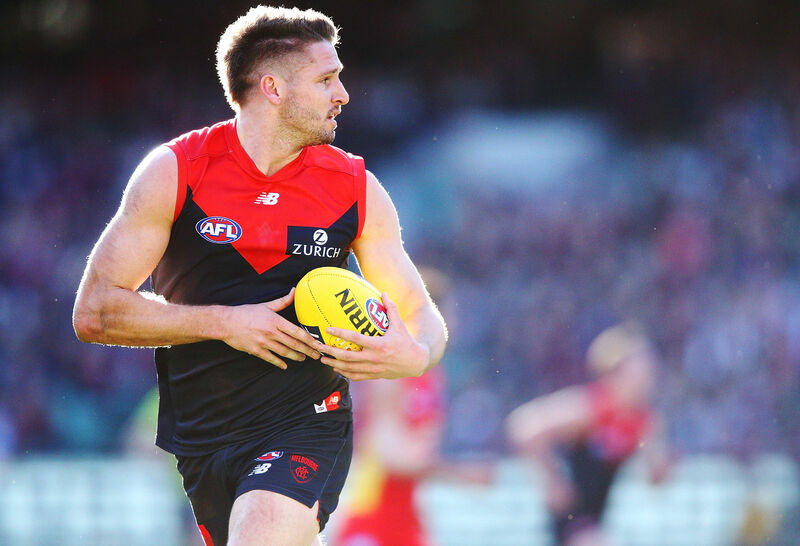 You only need to look at a player like Jesse Hogan now at Melbourne. When Jesse got injured, Melbourne started playing some really good footy. You have to be really adaptable in your role play I suppose, if there are some rule changes that come in such as zones and set up where players are starting in certain positions then that might change as time goes on. But the game is a lot more technical nowadays then what it ever was before. Shaw: Are you still involved in footy? Heatley: No, I’m not this year. I was involved in coaching over the last 10 years, but I have decided to have the year off. My work commitments have really increased, I do a lot of travel so it’s good just to spend some time with the family and not have to deal with the other stuff that coaching brings with it. I’ll be honest, I really miss it though. There might be something I do over the next couple of years in footy, but we will wait and we. Shaw: What makes up a day in the life of Jason Heatley now? What do you do with yourself? Heatley: I work for the Reece Group. The role I have there is the National Business Development Manager working in the refrigeration and air conditioning division, this keeps me really busy. I look after a portfolio that’s worth well over $23-$24 million dollars. There’s always lots to do for me from a work front. I’m currently living in Donvale with my lovely partner Alison and her two children, so they keep me on my toes aswell. I also have my two kids that live with their Mum down in Phillip Island. Shaw: How old are your kids? Heatley: My daughter is about to turn 16 and my son is 13 and a half. Allison’s boys are 11 and 8. Shaw: Do your kids follow footy and is there a chance of them playing footy? Perhaps at AFL level? Heatley: They are mad St Kilda supporters. My daughter actually did some work experience for St Kilda during the last school term and got a write up about it. She’s into her footy and has dreams of playing for the women’s side one day so that would be nice to see her achieve that. Shaw: Looking into the AFL world, there has been a lot of discussion around concussions and the impact that they are having on players. Did you ever experience concussion during your playing career? Heatley: I did, I had a few concussions actually. With the game evolving and sports science and the medical assistance that is provided I think it is paramount that we protect the player. There’s no doubt about it. I’m all for the AFL being really solid and not being flexible about their concussion rules because we need to protect the players and make sure that they come out of it at the end of their career with all of their faculties. Shaw: Do you have any specific opinions towards concussions in footy? Heatley: We have to follow the advice of medical professionals. I think that it is something that the coaches and the staff have acknowledged now. If the practitioner says on the day that player x is concussed and won’t be back on the ground, then that’s the decision and everyone moves forward. 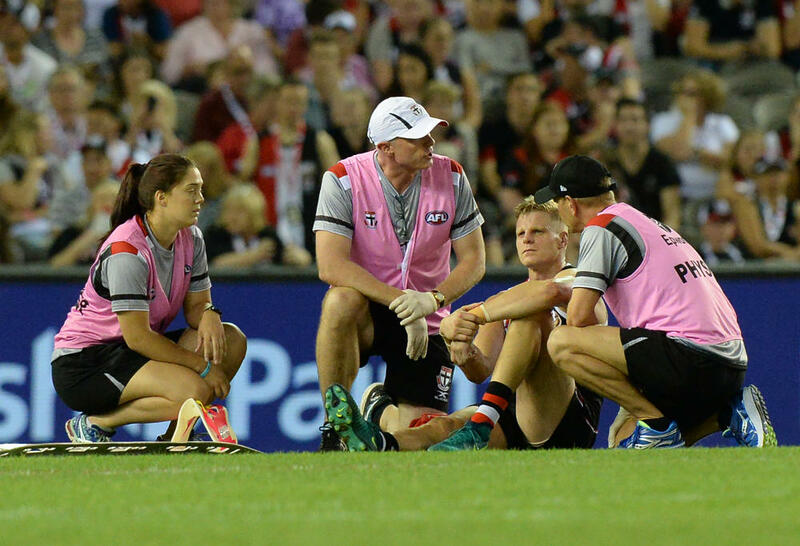 The protection then around that player is that they are rehabbed during the course of the week and goes through the full concussion protocol before they are even considered to be able to play a game of footy again. Whether it’s an AFL game or a VFL game, I think it’s all the boxes that need to be ticked which is great. Shaw: Was there as bigger focus on the dangers of concussion when you were playing compared to what there is today? Heatley: There certainly was. The doctors are supremely diligent in any era that you play in. I think what the players could do though, ultimately is make that decision to go back on the ground. I’m not sure whether you would call it a bit of a grey area, but I know there were times where I went out to play after being concussed, that in today’s environment this wouldn’t have happened. This is not the doctor, this is the player saying, “No I want to get back out there” for the team. We have to be really careful just to talk about players medical history in that regard, but I think that the way the AFL and the clubs handle this now is first class. Shaw: Does it scare you just how dangerous it can be at times? Heatley: Absolutely, people are saying the game is not as tough as it used to be but to me that’s a load of crap. The players are going as quick as they ever have been and they are really powerful athletes. Any sort of collisions they are having on the ground is going to hurt. So, the chances of someone getting injured, concussed or hurt is always going to be there. But the reality is that we are playing a contact sport and unfortunately accidents do happen. Most of what we see are accidents because the AFL has been really good with their protocol around tackling and protecting the player that wants to put their head over the footy. Shaw: Do you think that the use of helmets would help to decrease the amount of concussions? Heatley: If you ask Nathan Burke he would probably say yes. I’m not really sure of the answer to that. There is a lot of junior clubs that make it mandatory for their young players to be wearing helmets. I’m not the best one to answer that question. Shaw: Do you believe that the AFL could do more to combat the amount of concussions that are occurring by introducing rule changes etc? Heatley: I don’t think you can decrease it. There is a large amount of contact about it, unfortunately players are going to be subjected to being concussed at different times. I’m not sure that will be the case. One thing now though is that players are more aware around contests and what they are doing. There is a bit of a player’s code now that we don’t go hard at the head. The head is an important part of the human body and that is good for the game to see that players recognise this. Shaw: At times, we hear stories of former players wishing to sue the AFL because of how they are suffering permanent or long-term effects of concussion. Do you feel that this is reasonable given that sport is something that is voluntary to participate in? Heatley: I’m not aware of any instances of that at the moment so to answer that totally I don’t know. The players get lots of advice on what they can and can’t do. We might have to look at the NFL in America as an example. There are hundreds and hundreds of lawsuits at the moment against the NFL around the concussion protocol and this is why the AFL is so diligent and don’t buckle away from it. I can’t talk much about any such cases in the AFL but I am sure they can work themselves out. Shaw: As strange as it might seem, do you think that players themselves could do more to prevent the risk of concussion while out on the field, like not going so hard into a contest or a tackle? Heatley: If you take that out of it, then players will go the other way. Players look out for each other more than what they did in the past. I know we see some instances of tackles and slamming tackles as such because the players acknowledge those threats around them. They will protect themselves accordingly. For me, it’s about how we teach the kids coming through, especially the women that are coming through now and leading themselves up to playing AFLW. There is a certain way that you protect yourself when you go into a contest but as I mentioned before we are playing a contact sport and unfortunately things happen sometimes. Shaw: Jason, thank you for taking time out of your day to talk with me. As a St Kilda supporter, I have really enjoyed the opportunity to be able to speak with you. It is muchly appreciated. Heatley: Good on you Lachlan.